It's been quite a while since any of the classic Looney Tunes characters made their way to the big screen for a feature-length project, but that's hopefully about to change as Speedy Gonzales is getting his own animated movie. As Deadline reports, the quick little mouse will soon zoom into theatres with his very own starring feature. The character, whose first starring cartoon landed in 1955, was initially voiced by Mel Blanc, who did a Mexican accent impression that some have since found offensive. This time around, however, Gonzales will be voiced by Mexican actor Eugenio Derbez. 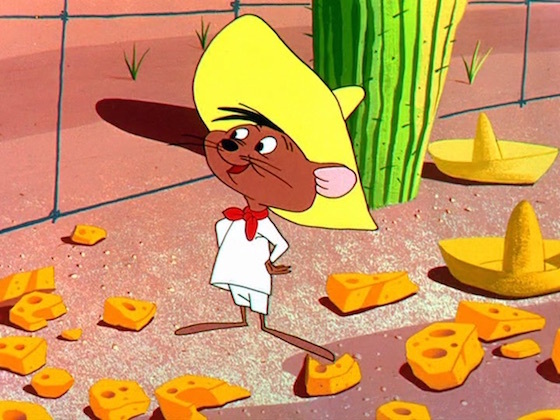 In Mexico we grew up watching Speedy Gonzales. He was like a superhero to us, or maybe more like a revolutionario like Simon Bolivar or Pacho Villa. He watched out for the little people but with a lot of bravado and a weakness for the ladies. I'm really excited to be bringing this character to the big screen. And besides being Mexican— my full name is Eugenio Derbez Gonzalez and I have big ears. The casting couldn't be better. The Speedy Gonzales movie currently has the working title Speedy. It's being written by Hank Nelken, who previously wrote Are We Done Yet? and Saving Silverman.